Stevie Wonder at NAMM 2016 before deciding to order harps. 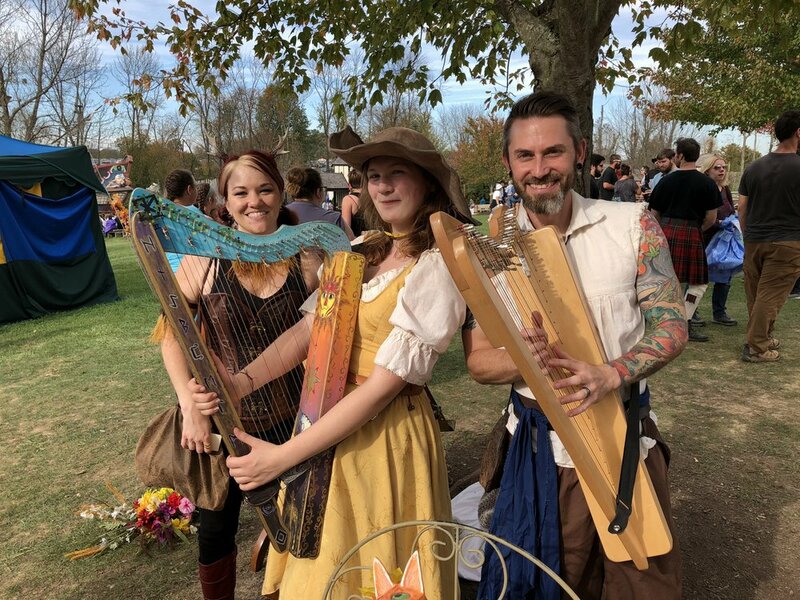 Melissa Irwin, Lilu Stocker & Garen Rees at the Ohio Renaissance Fair. Lilu decorated her Sharpsicle™ Harp herself! Úna Ní Fhlannagáin and a young Irish harp student. Elder care center in Coronado, California. Melissa Irwin plays for Cluck Norris and his beloved Wonton. You never know who will take up the harp! Not every harp needs to have every bell and whistle. Sharpsicle™ Harps, with sharping levers on the C and F strings, have found a number of niches in the harp world where they are precisely the right harp for the job. Because they are lightweight and easily played on a strap, Sharpsicle™ Harps are frequently the choice of harpers who go into hospitals or NICUs or elder care centers or hospices to play. Sharpsicle™ Harps also have just the right range and levers to accommodate a significant Celtic harp repertoire. 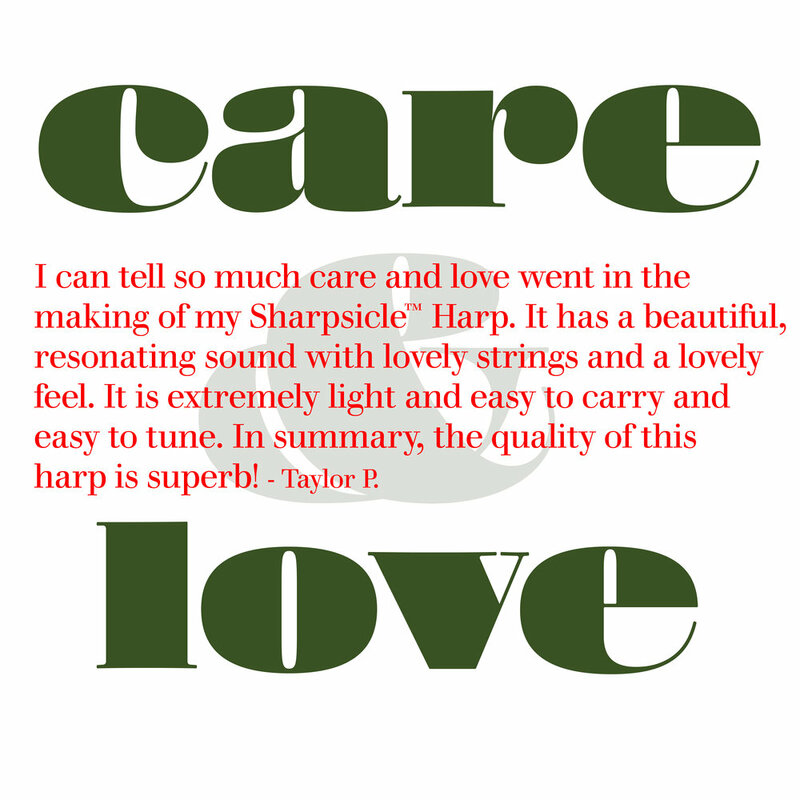 Programs like the International Harp Therapy Program have been recommending Sharpsicle™ Harps for more than a decade and have spread these little harps around the globe as a result. natural maple, black, white, red, orange, yellow, green, blue, purple and pink. The Sharpsicle™ Harp has levers on the C & F strings making it well-suited for Celtic music and frequently the choice of harpists wishing to have a harp for music therapy as well as the recommendation of most of the major harp therapy programs. 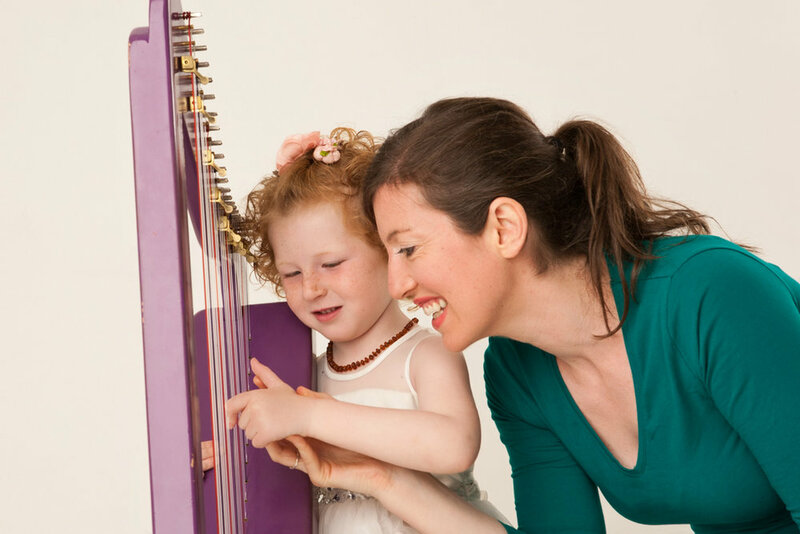 The Sharpsicle™ Harp is also incredibly popular with harp and music teachers for use with students. It can be played in the keys of C, D, G and the relative minors and it has bridge pins on all the strings so additional levers can be added later if desired. This is a great, budget-friendly model with expansion opportunities not available with the basic model in the line. Comes with string chart and tuning wrench. Hover over the harp and click "Quick View" for more information and colors. Would you like to take a look at the next step up? Sharpsicle™ Harps are most often purchased by those planning to use the harp for therapy or by Celtic harpers who are purchasing either a first harp or a travel harp. For all harpers planning to transport their Sharpsicle™ Harp on a regular basis we recommend a Harpsicle® Harp Bag. We also recommend that every harper carry a second chromatic tuner and back-up tuning wrench in their bag just in case. You also may wish to consider an extra string set because strings seem to "know" how to break at the most inopportune times. Most harpers find that a Harpsicle® Stick makes it easier to have your harp at the right height and easily balanced when playing. Since therapy harpists often stand near a bedside to play, we recommend a harp strap. We have a selection that includes both a simple strap and some really wonderful straps made by this dynamic little business we fell in love with many years ago. We have supported this special little strap company because the unusually soft underside of their straps does not damage the finish of our harps and we love their colorful designs. We have a Therapy Harp Package, a Irish Pub Package and a 911-HARP KIT to save you some time and trouble in picking out accessories. The Snark Super Tight Chromatic Tuner is an essential accessory for your harp. In fact, we recommend that if you plan to gig with this harp you have an extra one that you keep in your harp bag just so you never get caught without one. A chromatic tuner makes it easy for anyone, even the most basic beginners, to tune a harp. Over the years we have tried so, so many tuners but we keep coming back to the Snark. It clips easily onto Harpsicle® brand harps and detects both high and low strings equally well. Simply clip the tuner to any part of the harp to pick up vibrations. We prefer clipping the tuner to the arch of the harp. You can also clip the tuner to one of the tuning pins. The back-lit display will indicate what note the string is playing and whether or not the not the note is sharp or flat. This clip tuner provides very accurate readings as it picks up the instruments vibrations rather than relying on a microphone like other tuners. This also allows you to tune your harp independent of background noise. We use these tuners everyday here at Rees Harps Inc..
Úna Ní Fhlannagáin's harp student, Sophie Griffin, and Sophie's family were selected to be in a reality TV show called 'Twin Towns', where they swapped lives with the Fitzpatrick family, from Seattle, for a week. Ergo Úna gave Kieran Fitzpatrick a harp lesson, on Sophie's Sharpsicle™ Harp, in Galway, Ireland. Just you watch to see how he got on...! © 2018 Rees Harps Inc. All Rights Reserved - Harpsicle® is a Registered Trademark of Rees Harps Inc.. Sharpsicle™, Flatsicle™, Fullsicle™ and the phrase "Play Your Harp Out" are all trademarks of Rees Harps Inc. Rees Harps Inc. prohibits the use of any of its registered or trademarked identifying marks without express written approval.